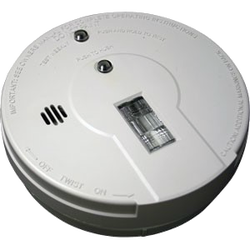 How Do Photoelectric Smoke Detectors Work? - Metro Fire LifeSafety Inc. Occasionally you will walk into a store and a bell will go off as you cross the threshold. If you look, you will often notice that a photo beam detector is being used. Near the door on one side of the store is a light (either a white light and a lens or a low-power laser), and on the other side is a photodetector that can "see" the light. When you cross the beam of light you block it. The photodetector senses the lack of light and triggers a bell. You can imagine how this same type of sensor could act as a smoke detector. If it ever got smoky enough in the store to block the light beam sufficiently, the bell would go off. But there are two problems here: 1) It's a pretty big smoke detector, and 2) it is not very sensitive. There would have to be a LOT of smoke before the alarm would go off -- the smoke would have to be thick enough to completely block out the light. It takes quite a bit of smoke to do that. In the normal case, the light from the light source on the left shoots straight across and misses the sensor. When smoke enters the chamber, however, the smoke particles scatter the light and some amount of light hits the sensor. The sensor then sets off the horn in the smoke detector. Photoelectric detectors are better at sensing smoky fires, such as a smoldering mattress.